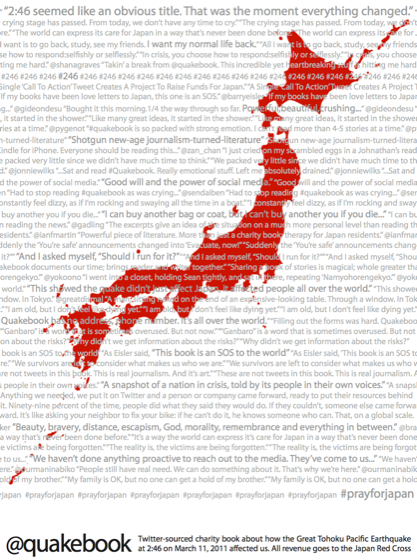 We are honoured to tell the world that Sony has done something amazing by offering Quakebook as a download from its e-Reader store (and advertising it on their homepage) to all its customers in exchange for a donation that goes directly to the Japanese Red Cross. How much should you donate? We leave that up to you. If you can spare a lot, give a lot. If you can’t – we understand, give what you can. Download the book with our backing, in the knowledge that you have helped the survivors of the Japan earthquake and tsunami with cash, and equally importantly, with your attention. Donate and download right here. When the earthquake struck I was walking in the street near Shinjuku. I felt the difference straight away, usually you cannot feel quakes if you are outside but that day the buildings made noises that one only usually hears when inside them; the walls bulged and the windows rattled. I felt seasick and I stumbled along the pavement with the telegraph poles twirling above me and the trees dancing, their empty, spring branches whipping the air. That something bad had happened was palpable; the fear worsened by my inability to call my family because the phones no longer worked. As aftershock on aftershock wobbled the earth for the next days the feeling that nothing good could ever happen again grew. It was hard to live that much suspended from the future, and for so long. Like the pause of the condemned on the scaffold steps, everyone I knew was waiting voicelessly for the next quake, worried that our luck was running-out and that next tectonic rumble would be the end of all our hopes against it. The quake was a story that hit me in the face as a photographer; the sort of thing we ordinarily dream of. I was the very model of in the right place at the right time yet I didn’t ask for it and as the enormity of what had happened sunk in, I sought it even less. It was a story that I could not find in me the energy to follow at first: it was too close, too big, too many divergent emotions were calling me north and keeping me in Tokyo with my frightened family. But then the choice was taken away from me somewhat: the commission came and I found myself on a plane heading north with a journalist that was being constantly bullied, on his Blackberry, by an editor wanting in-depth misery on our whistle-stop-tour of towns and villages that lingered in our memory much longer than we lingered in their ravaged geography. It was the worse kind of parachute journalism yet I am glad I went because the overwhelming result of our visit was a new empathy for the amazing people of Tohoku and a lightening of the hellish sense of foreboding we had lived under for the week since the Earthquake struck. In Iwate I went to places that had real problems, ones the media would exaggerate of course, but they didn’t need to. I saw things that have put all my fears in harsher perspective; things that have shown me the supreme power of nature and also the no less impressive strength of the human spirit. No hype is needed where hell exists unshielded and visceral. And yet even as I wiped the mud from my shoes at the hotel in Morioka for the first time in a week I was not scared, I was not looking for a way out and I was not worrying about gossip. There are problems in the world don’t get me wrong, I understand that and in this part of the world especially at this moment things are more than difficult. The ground ignores us as its folds and shudders; yet we still do not respect it enough and have not heeded its warnings. Japan‘s days are numbered, for sure; but I know that number is in the billions and I need not worry too much. I have love and memories. I have almost all I need which the people of Otsuchi, Kamaishi, Kamiarakawa, Ofunato and especially Rikuzentakata, that I visited, do not. While the journalist wrote his piece that first night I wrote a blog to reassure friends and family of my safety. I wrote because I was no longer scared and that is the emotion I wanted to share most. Fear seemed selfish and self-indulgent after I had met people who had lost everything and enjoyed their smiles and welcomes even as we intruded on their lives with our questions and lenses. When your neighbours stories are equal to or more tragic than yours, who do you share the pain with? Maybe they found it cathartic to talk to us or perhaps Tohoku people are just stronger but I saw people pick their way through wreckage that would have defeated me with it melancholy and just get on with the job of living anew. For example I met an 80 year old woman who had survived Hiroshima and who smiled a ready “hello” to us as she walked through the rubble of Kamaishi with a purpose to her brisk pace that belied both her age and any destination she could have been going to in that smashed and empty town. She was proud and for a moment worried about being photographed with no make-up on until it struck her that she had no make-up any more. She was most proud of having saved her husband though, driving down to the seafront to pick him up as the warnings sounded, and racing the tsunami as she sped up into the hills to safety. She was a good driver she said. I also met a man, whose wife and mother, had been swept away in the tsunami. He was searching his car when we met. The car rested at 45 degrees against the remains of a house and he was looking for the insurance documents and something, anything personal. He joked about not being able to get the money back then a friend walked past and we became unimportant. He shut the door to the car carefully as he left with his friend, locking it as if it was still parked on the road outside his now non-existent house. It was a small act of routine and normality that showed me, despite the sudden emptiness to his days, that he will recover. My time in Iwate was a one of snow and mud, of boats in rice fields and houses in the sea. It was also a time of stoicism and carnage and yet I am proud to have lived for that brief moment among people that do not blame, do not hate, do not give up and do not stop being all that is best in this damaged world of ours. Their lives made me understand when fear is truly justified; which is why I am not scared anymore. First, the good news. In fact, really great news. 1. 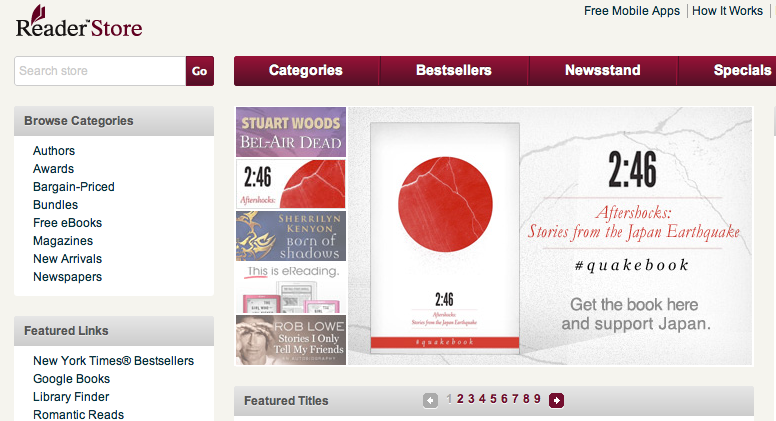 Amazon has agreed to print a real book of 2:46 – Aftershocks: Stories from the Japan Earthquake. 2. They are going to release an ebook in Japanese, and a print version. 3. And the same in German. The only people who gain from the purchase of the book are the people suffering in Japan. Let me repeat: 100% of the money goes to the Japanese Red Cross. None of us involved in this is making a penny from it. And that’s just the way we all want it. It’s the promise I made to every contributor, every person who buys a copy, and to the survivors of the earthquake. This book tells their story, so it’s only right that they should reap all the rewards. And now the bad news – the news cycle. Frankly, Japan has dropped down the list of top stories. The world listened when we said we have created a compelling book in one week. Then, the world waited and bought the ebook – making it the No. 4 top selling non-fiction book on Amazon that week – just through word of mouth. And now we must grab the world’s attention for a third time – to buy the paperback book. That’s a tough call, but also know this: we will get the world’s gaze once more. I have some ideas that I will outline in the coming days to win the war of attention. It’s a war we must win. And we shall. Log in or sign up at Amazon.com. No money goes to Amazon or Quakebook. 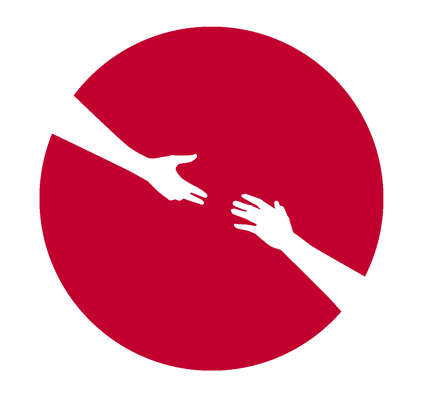 All cash, less any tax, goes to the Japanese Red Cross. Feel free to send this Video to anyone who might need a little help dipping their toes into the digital pool. I’m about to submit an assignment for Uni where I had to remediate a text. I chose the @quakebook twitter stream and as such have created a graphic with a multitude of uses and a couple of parallel meanings. I have a deep affection for Japan, its people and culture. And as this is a matter close to my heart, thoughts and prayers, it was only obvious that I do something which may be able to be given in return and to contribute in any way to the wonderful project of the quakebook. In saying this, I am happy to submit my artwork to you also, for use and as a contribution to the project. 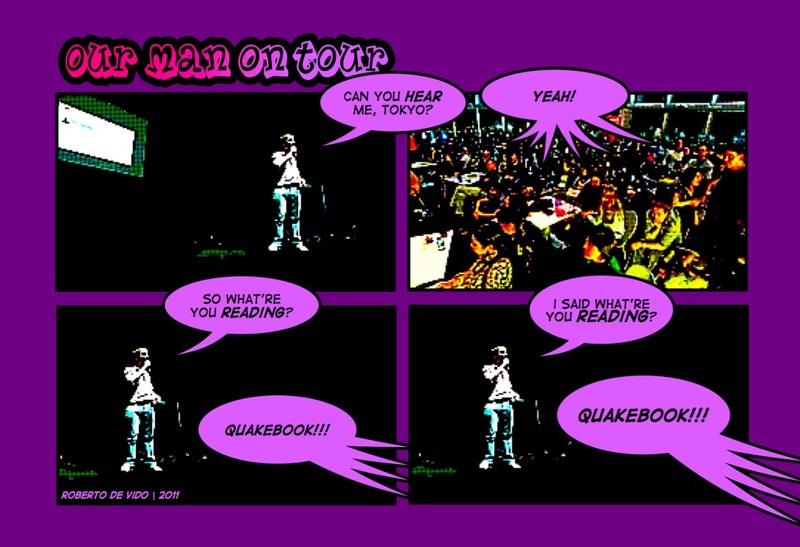 Our Man in Abiko made a surprise appearance at Pecha Kucha Night in Tokyo on Saturday, and he KILLED. Ask anybody wot woz there. We’re used to minor earthquakes here. Happens all the time. Few people at work really paid attention when the ground started shaking this time. I was in a conference call and saw people smiling and talking unconcerned at first, until we realized the tremors were getting unusually big. Office buildings here tend of have earthquake survival kits, containing a helmet, flashlight, and other necessities, under each desk. We all took cover under our desks, opened the kits—most of us for the first time ever—and took out the helmets. The scene looked like a drill of some kind. Our building, which is built like a tank and probably as wide and deep as it is tall, began swaying heavily, and monitors on our desks moved freely from side to side. Everyone, except for a few battle hardened traders, left the building as soon as the first tremor abated. A second one came soon after, and cranes on top of Marunouchi’s skyscrapers swung back and forth like pendulums. Mobile phone networks quickly broke down, unable to handle the millions of people trying to call or send messages. With no means to contact friends and family, some of us decided to leave. However, all trains had stopped, busses were either out of service or already packed with people, all taxis were immediately taken, and traffic jam was building up everywhere. Many people, me included, decided to walk home. It was as if the whole city suddenly turned into a gigantic marathon walking course. For some people the distance was just too great, and the city offered temporary shelters in parks and arenas for those. Aftershocks continued during the evening, night, and the following morning. Power outages in Tohoku made it difficult to reach friends and relatives others up north, and tsunami disaster reports began sharing airtime with another developing story: Malfunctioning reactors in Fukushima. 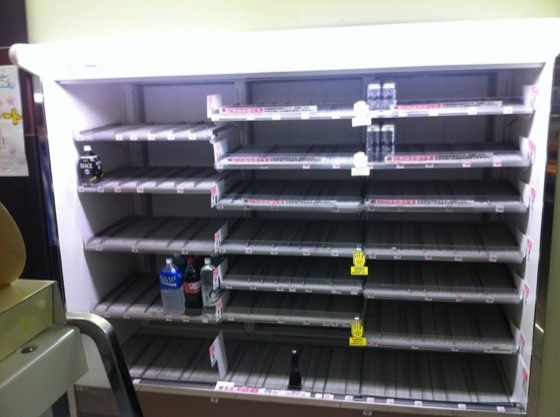 The next few days were equally surreal: Constant sound of ambulances and fire trucks rushing by, empty shelves and impossibly long lines at otherwise quiet and well stocked supermarkets, and 24 hours news frequently interrupted by early warnings about imminent aftershocks. Shock and sorrow after a natural disaster combined with an increasing fear for an unfolding man-made disaster. Tokyo has since largely returned to business as usual. Trains are as packed as always, shops restocked, and after-work izakaya bars once again full of intoxicated salarymen sharing a few yakitori skewers before heading home. 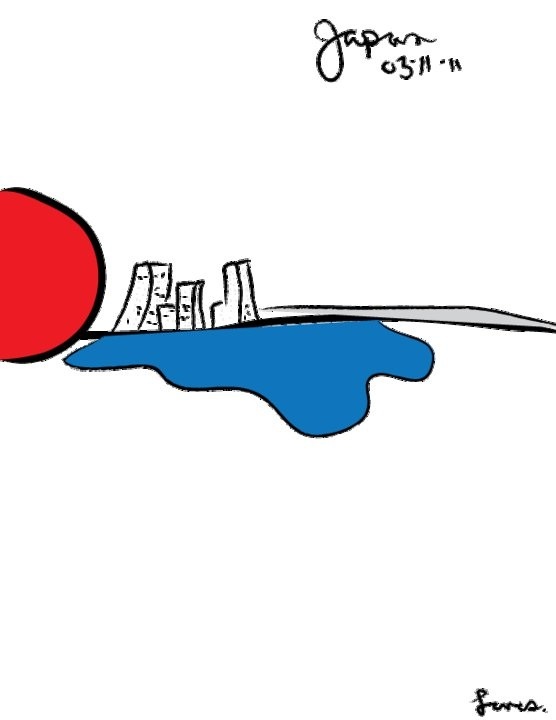 However, the wide ranging energy saving measures, from escalators taken out of service to dimly lit stores and signs, serves a reminder to us in the mostly unscathed capital of the tragedies in the Tohoku area and the work ahead. My last class of the day at Yasuoka Elementary School had just ended at 2:40, and I was walking back across campus to the junior high school. Elementary English was now finished for the school year, so I had a pile of things in my arms. My third graders had given me a bouquet of paper flowers to thank me for one year of teaching them. Among other things, it had been a really good day. Suddenly, I felt violently dizzy. The world swayed like a boat, and I noticed the heavy gymnasium doors were rattling. A moment later, I knew what was happening, and I quickly turned and headed away from the building. Looking back at that moment, I was surprisingly composed. My equilibrium was thrown, which is an awful feeling, but it was nothing compared to what people had felt many miles north of me. As my students evacuated the school to the sunny parking lot, we had no idea how different this quake would be. It wasn’t until all the students washed their shoes and entered the building again, that I saw images from what seemed like a movie on live television. The Pacific coast of Miyagi, where I had visited less than a year previously, was on screen. Water rushed up and flooded a section of the expressway. Cars were turning around; they had no choice but to go back the wrong way. Then, a huge freight boat smashed into the side of the highway. The water rose higher and carried away all the vehicles. Other teachers in the staff room gasped, and my vice principal yelled at the cars on TV, telling them to turn around. I suddenly felt dizzy again. The name cards on the far wall clicked and swung on their hooks. Aftershock. 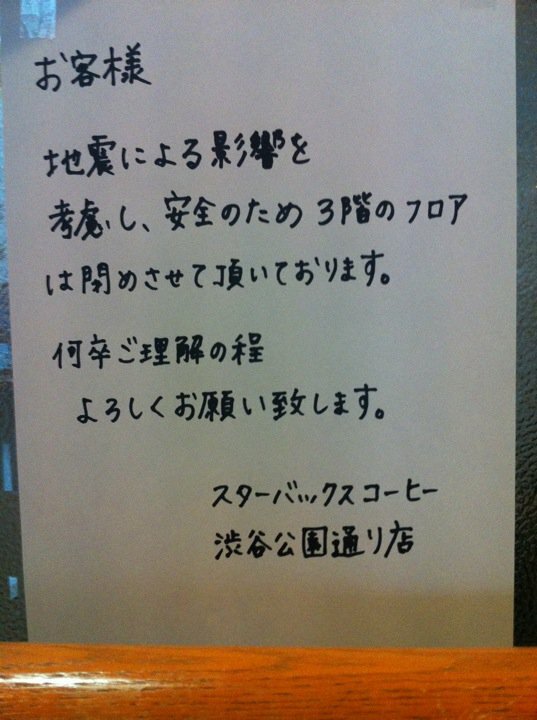 I left work that day feeling sad and confused about the fate of people who lived near Sendai and East Iwate. I also wondered if there was chaos in Tokyo with traffic frozen. Nothing had solidified. There wasn’t even a death toll yet. I simply had no idea what would unravel in the next week, or even month. Only hours after I had fallen asleep that night in Nagano City, I was shaken awake by another one. This one felt stronger and closer; I could see things on the shelf rattling in the dark. It passed without harm, but it was the first of many more I would feel in the days to come. To sum up, the first weeks of aftermath were a blur of dizziness, lines at gas stations, urgent emails from family, nuclear research, graduation prep, tearful news stories, sleepless quake-alarm nights, and news fueled with fear. Nagano, however, was turning out to be fine. Fear did more damage than radiation. However, our fears weren’t wholly unjustified. There were warnings of aftershocks along an active fault in our prefecture. It could have been us, we thought. My husband and I wanted to help. We donated blood, money, blankets and water, but we still needed something to settle our minds. 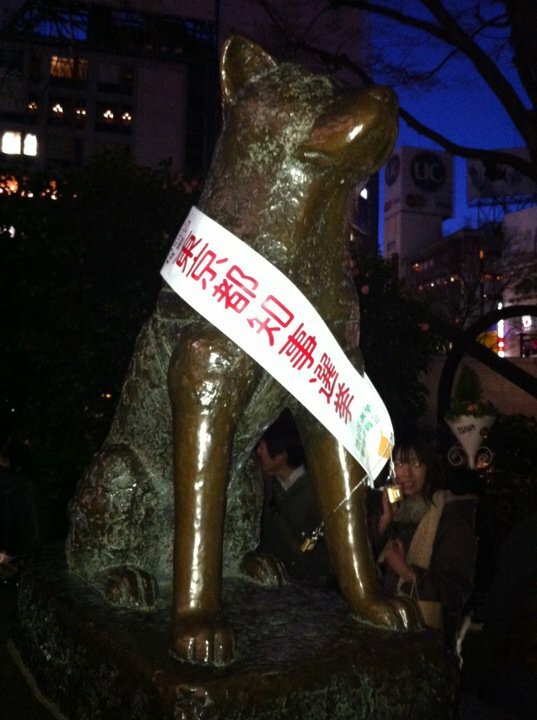 We found a volunteer NGO, Peace Boat, and went to Tokyo to see about opportunities to help. My husband was sent up to Ishinomaki, north of Sendai, less than a week later. My school started earlier than his, so I had to stay behind for work. During his time there, I had limited contact with him. On the night before he came home there was a massive 7.1 aftershock that shook Ishinomaki and a tsunami warning. The experience was surreal for him, as I sat at home helplessly watching the news, wondering. Now it has been a month, my husband is home and the sakura are in bloom. It seems life – for us – might finally return to normal. But the Tohoku situation is still on our minds often. The last big aftershock set off another assault from the ground to the shores of the northeast. I felt one again just last night: dizziness, M7.0 in Fukushima. These shocks could continue for months or even years, and the Daiichi power plant is now classified a Chernobyl-level disaster. It has made me think about life, and death too, respectively. Everyone’s wave comes to claim them at some point. We’ve lived here for about two years, now. In that time we’ve been given a comfortable life, limitless opportunity, and heaps and heaps of kindness. We want to give back, and we’ll soon go up to Ishinomaki for more volunteering (a second time, for my husband). I can’t deny that I’m a little fearful, and a part of me knows I can’t even relate to the situation. But now I know the person I want to be when my wave comes.